Welcome to this week’s sketch challenge with the Paper Craft Crew Design Team! I’m using the holiday stamp set that you’re able to pre-order this month for yourself, called Carols of Christmas. Aren’t you glad that you get to pre-order this set before September – a perk that’s usually just for demonstrators! 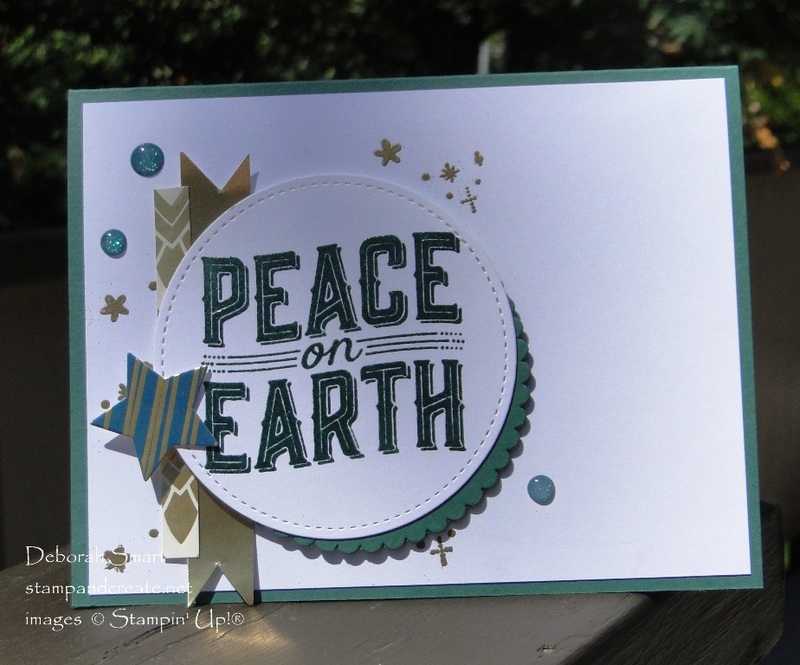 My card uses the Peace on Earth sentiment. I’m really liking the large sentiments in this stamp set! I chose to go with a non-traditional Christmas colour, although some people may call Tranquil Tide a kind of green. I stayed right on the sketch this time, I think. The sentiment is from the Carols of Christmas set. Since it was going to be my main focus, I decided that I wanted to make it stand out. First I inked the stamp in Versamark ink, then immediately inked it with the Tranquil Tide ink. After stamping onto Whisper White cardstock, I covered it with Clear Embossing Powder, and set it with the Heat Tool. This is a great way to emboss in any colour, even without coloured embossing powder! The Layering Circles Framelits are used to die cut the scalloped circle, and the sentiment is die cut with the Stitched Shapes Framelits. I offset the layering, so as to show off the scallops. 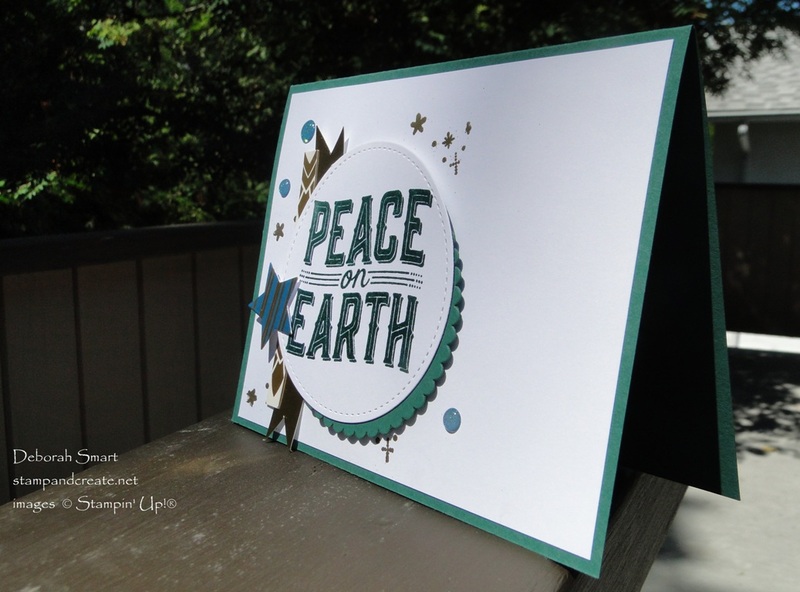 To create the background, the stars images from the Carols of Christmas were stamped in Versamark ink, then embossed in Gold Embossing Powder, on the Whisper White cardstock panel. I used the retired Stars shapes framelits to die cut the star from the Eastern Palace Specialty Designer Series Paper, as well as cutting strip from the gold & white foil design from the same DSP. The larger banner strip is Gold Foil Paper. After layering all the pieces, I added some of the Glitter Enamel Dots to the card front. Finally, the front panel was attached to a Tranquil Tide cardstock base. Come join the challenge! Check out what the rest of the talented Design Team have created, and grab the link on our Paper Craft Crew challenge page. Then when you’ve created your card, link it up for the challenge. I can’t wait to see what you create! Click on the images below to order the supplies needed to make this card. You’ll be taken directly to my online store. If you’d rather, contact me directly, and I’ll place your order for you! Thanks for taking the time to have a look – I’d love to read any comment you’d care to leave for me! Previous Previous post: New Clearance Rack Items! Beautiful card! I love that sketch. What an adorable card!! I love how you offset that sentiment from the pinked circle! !